The Hockey Hall of Fame's largest outreach exhibit system, this 2,000 square foot display has a sleek new look that compliments the great players and moments that it showcases. Unveiled during the 2008 IIHF World Championship that was held in Quebec City, Quebec, the system was designed and funded in conjunction with the International Ice Hockey Federation, celebrating not only the history of the game, but the IIHF's 100th anniversary in 2008. The exhibit system features 20 uniquely themed showcases and almost 200 unique Hall of Fame artifacts that promise to thrill audiences young and old with colourful large-scale graphic components that compliment each showcase. Along with the core NHL themed display, the full set-up is also available with the full International or Canadian Hockey League themes….or can be tailored to suit the specific needs of your event. 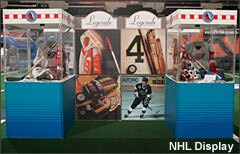 A Hall of Fame classic, "The Original" Hockey Hall of Fame mobile Legend's Exhibit features 12 unique showcases that are complimented by a graphic component and has been designed for set-up versatility. In use since 1998, the exhibit system has travel from coast-to-coast across North America and has been a fan favourite wherever it goes. 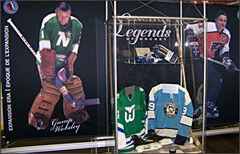 Not only can Legends tailor the exhibits to suit your needs, whether you are looking for today's NHL or a history of hockey in your area, but we also feature two full non-NHL set-ups with graphics. 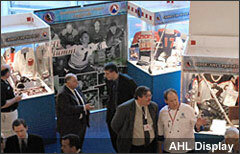 The American Hockey League Legends exhibit was unveiled for the first time at the 1999 AHL All-Star Classic held in Philadelphia, Pennsylvania and offers a unique and colourful display covering the league's 70+ year history. 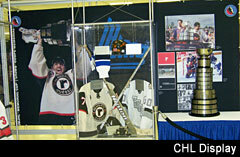 Four months later, the Canadian Hockey League Legends exhibit was first unveiled at the 1999 Memorial Cup in Ottawa, Ontario and it covers the entire history of major junior hockey and the Memorial Cup. 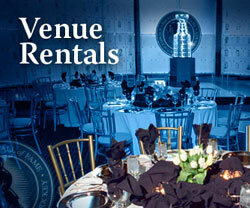 Themes available include all of the above, as well as many, many more. Please ask about any subject that you may be interested in. Click on photo above to enlarge. 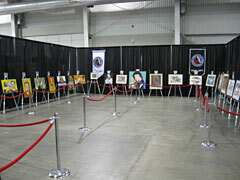 Individual Showcases, featuring approximately 7-9 artifacts each are available for rental in sets of two. A great way to bring a piece of the Hall to a smaller scale event/function, the artifacts can be tailored to suit whatever theme/needs you may have (depending on artifact availability) and can fit in almost any size space. 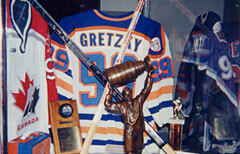 The Turofsky Collection is the world's single largest collection of hockey photographs. Noted brothers, Nat and Lou Turofsky, began taking photos in 1907 and quickly established themselves as the premier photographers in the sporting world. Their spectacular and diverse hockey photographs truly captured the essence of the game, from the stars to the journeymen, from the glamourous arenas to the dank training facilities, all of which chronicle the Original Six era. Imperial Oil Ltd purchased the collection on December 2, 1981 for $15,000. Imperial then donated the collection of 900 glass-plate negatives and 21,000 cellulose negatives to the Hockey Hall of Fame where they are now archivally preserved. 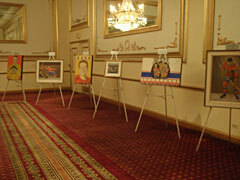 Twenty-seven of these images have been selected for the exhibit. 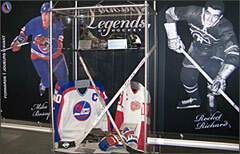 The Summit Series of 1972 was considered by many to be the best hockey ever played in any era. The most talented hockey players from the Soviet Union played an eight-game series against the very best NHL players from Canada. It was believed throughout North America that Canada would dominate the series, especially since the Soviet's young goaltender, Vladislav Tretiak, was scouted as possessing minor-league talent. This was far from the case. 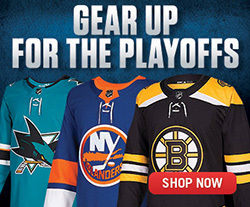 Leading up to the final game the series was tied at three wins apiece and one tie. Played in front of a hostile Soviet crowd, Canada went on to win the final game in the dying minutes of the third period on a heroic goal by Paul Henderson. The Series was so intense it evolved into more than a goodwill match between two countries; it became a war of political differences. 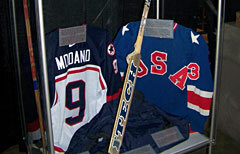 The impact those eight games had on international hockey was immense and the creation of an international rivalry was born. The 'Series of the Century' collection provides a synopsis of some of the tenuous and highly emotional moments highlighting the eight games. *Many other photography themes available at extra cost associated with the production. The Hockey Hall of Fame's collection of artwork is a great addition to any exhibit rental or stands alone as an exciting visual history of the world's most exciting sport. Featuring more than 25 original paintings and lithographs, the collection depicts some of hockey's most notable historic moments and figures through the eyes of a variety of artists of different styles. 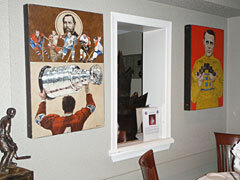 The Thompson collection is comprised of 12 canvases that illustrate hockey's great feats such as the Montreal Canadiens' dynasty of the 1950s; Joe Malone's record seven goals-scored in one game for the Quebec Bulldogs; General Manager Lester Patrick's lacing up for his New York Rangers during the 1928 Stanley Cup Final; the longest game in NHL history; the grand opening of the Hockey Hall of Fame at Toronto's Exhibition grounds, and many more. Together they are a show stopping set for any gallery or display space. Most notably, the collection boasts an original work from American pop artist Andy Warhol, whose 1977-78 Athlete Series showcased prominent sports figures including New York Ranger and Hockey Hall of Fame Honoured Member Rod Gilbert. The series was commissioned with the belief that the two most popular leisure activities, art and sport, should be brought together. Our largest painting is a 6' x 4.5' action portrait of Montreal Canadiens' legendary captain Jean Beliveau, realized by artist Dennis Maggs to commemorate Beliveau's induction into the Hockey Hall of Fame in 1972. The stature of this commanding showpiece is only fitting for its subject. Many more portraits, career retrospectives, and hockey scenes are brought to life by artists such as George Guzzi, Scott Chaplin, Michel LapensÃ©e, and Daniel Parry. In addition to paintings, original cartoon artwork, sculptures, goalie masks, and painted hockey sticks are available where multimedia can be accommodated. A small area with large screen, or individual monitors throughout your venue are all that are needed to bring the Hockey Hall of Fame's Video Archives to life. With 1000's of hours of footage covering all facets and aspects of the game, we are able to add a unique element to any event, function or fanfest. Whether it's the award-winning Legends of Hockey series, NHL player features, International Hockey match-ups or speciality videos, a theatre is sure to entertain all. Please ask about any specific themes you may be interested in viewing.